I have roughly 2,800 people in my regrettably-not-well-sourced personal genealogy database. Some of them — my parents and grandparents, for example — have a lot of individual event entries. And for many many more of ’em, I’m lucky if I have their names and a guesstimate as to year of birth. 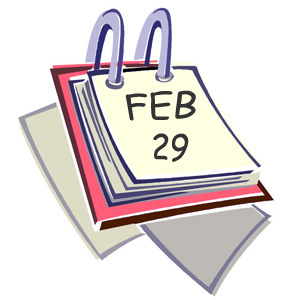 So… how many of those February events occurred on a Leap Day? The more recent was the birth of a third cousin in Texas in 1940.7 We lost that cousin last year.8 And the other was the birth of Sterling Jones, a 4th great granduncle (thank heavens for The Master Genealogist and its relationship calculator), in 1776. Good start. But not good enough. Check the North Carolina State Archives. They have a John Jones family Bible … but it’s from Alamance County, not Rutherford. Check the North Carolina State Library. They have materials from Beatrix Ramey, but no Bible transcriptions. Can’t find a website for Richard L. McCutcheon but Dr. Google informs me that there’s a Larry McCutcheon who’s been writing about the John Jones family. Wanna take bets what Richard L. McCutcheon’s middle name is? Track down references to him, find he has a link on another site to — tada!! — the very same Richard L. McCutcheon research notes I first found. Cool. Using the email address, reach out for Larry. He responds quickly, and I shoot back the question: where did you get your info? And attach my own line info so I’m not coming to the table empty-handed. While waiting for a response, locate websites for genealogical societies for both Cleveland and Rutherford Counties.16 One has a list of researchers with surnames… and e-mail addresses. I can’t resist. Maybe one of them knows who owns the Bible today, or where the transcription can be found. Larry responds with information about specific researchers in North Carolina who had personally seen and copied data from the Bible, and with corroboration of its information: the birthdate of his ancestor, John Jones Jr., on his Texas tombstone matches the birthdate recorded in the Bible. He also confirms that DNA puts his John Jones Jr. squarely into this particular North Carolina Jones family. And with digital images of the family Bible of Edmond Jones, Sterling’s and Elizabeth’s brother, and Edmond’s birthdate in that Bible matches what we’re told the John Jones Bible says. Better, but still not good enough. All I’ve got at the moment is at best a second generation derivative source: a report by person 2 of the contents of a transcription by person 1 of an original source, the Bible. And I’d still need to know more about the Bible to know if it contains primary information — whether whoever wrote the Bible entries was in a position to have first-hand knowledge of what was written. You have to love the twists and turns of a February 29th. All because I was curious… how many events in my family occurred on Leap Day? Hi Judy. Thanks for sharing. I am likewise looking for original copies of a couple of bibles. One is from the 1890s when I found it first mentioned. Another I mentioned on my blog and someone emailed me a transcript of it though they couldnt locate the actual document. I am also looking for a will that was transcribe but.the original was borrowed but not returned. Although we have located the researchers final genealogy, we have not located her original notes and copies of records she referenced. Ginger, I admit that when I was a baby genealogist, I could not for the life of me understand what the big deal was about citing sources. I guess I figured anything I found, I’d always be able to find again. Oh boy… was I ever wrong. And when originals go missing (I’ll have to write sometime about Marriage Book 1 of Johnson County, Texas…), it is sooooooo frustrating. Ah, yes. Johnson County, Texas. Don’t get me started. IS there a Marriage Book 1? Do tell. An official teaser: read the blog Saturday and find out! I may have at least one: The birth of Mary Gardner who married John Swain, son of Reuben. The Vital Records of Nanutcket, Massachusetts, to the year 1850, vol II, p. 57 says she was born “29th, 12 mo. 1748-9”, citing the Quaker records (“C. R. 4”). There is clearly something wrong with this date because the year that started Jan 1, 1749, was not a leap year. So, should it be 29th, 12 mo. 1747-8? Or is the day wrong and maybe it was the 26th or the 24th and got misread. I know — I should look at the actual Quaker records (there does not appear to be a civil or town record). Alexander Starbuck in his History of Nantucket … has exactly the same date: “29th, 12 mo. 1748-9”. His book was published in 1924 and the printed VR to 1850 in 1925; so my guess is that each author looked at those Quaker records independently and got the same answer. If these Quaker records listed births chronologically as they happened, it shouldn’t be too hard to tell the correct year. However, they might have compiled the birth records by family after the fact; see for example the early records of the Abington (PA) Monthly Meeting (FHL #383428, item 2). In that case, mistaks could be made. So, if she were born 29th 12 mo. [Feb] 1747/8 then she would be about 86 years and 8 months old in 10 mo. [Oct] 1834, and she would be born in a year that was a leap year so Feb 29th was valid. So, that is what I’m going with for now. Not to mention that her last name wasn’t, oh, Jones or Smith!